Fall is on the way and that means the addition of seasonal coffee concoctions to coffeeshop menus. The one everyone looks forward to is Pumpkin Spice Lattes. The most popular seller of this drink is Starbucks but if you’re vegan that’s not going to work for you. Many vegans have only recently discovered that their candy coffee craving for a Pumpkin Spice Latte has been met with the realization that the syrup used contains milk. Many Starbucks locations will give you the cold shoulder if you ask for ingredients and it seems corporate isn’t very forthcoming on what makes the drink unvegan. We sent in convert operatives to bring this dark information to light. It was not a easy task and a very risky one. The image you see above is the result. (Many Bothans died to bring us this information.) The fact is it contains the syrupy sweet dairy of condensed milk. Not only is condensed milk listed once in the ingredients, it’s listed TWICE. Notice the lack of what should be a main ingredient in that list: Pumpkin. It’s a Pumpkin Spice Latte, where’s the pumpkin OR the spices for that matter? No, natural and especially artificial flavors doesn’t cut it. More proof that Starbucks is the McDonald’s of coffee. Yes, there’s some chemical-ish preservative in there but that stuff does have to sit around until late-December. An inquiry to Panera Bread corporate did give me the answer that the syrup is indeed vegan if reading the ingredients wasn’t enough to convince you. I’ve been questioned as to whether the glycerin in Panera’s syrup is vegan. Upon a second thorough questioning they have stated that there are no animal sourced ingredients in their pumpkin spice syrup. For those of you who would like to eschew the expensive coffeehouse prices, as well as the preservatives, and make your own at home provided you have an espresso machine, hop on over here and give this recipe a shot. It is delicious if I do say so myself. Excellent investigative work! The Channel 4 I-Team would be proud. Good to know that at least Panera Bread cares, and your DIY recipe for pumpkin lattes at home is definitely going to be happening at our house in a big way this fall. Haha! That is one serious investigation. But yep, I knew about that and it makes me sad every year. I used to LOVE those, and so many of their drinks ARE vegan….not fair. Excellent post, thank you. Not that I have ever had this drink or wanted to have one. However, glycerin is usually animal-derived; a vegetable-based glycerin is available, but unless the label explicitly states it as the source, animal-based glycerin is the norm. In fewer than most situations glycerin is animal derived but in Panera’s syrup is apparently is not. As stated, I contacted them and they told me it was indeed vegan. Seriously, I am under the strong impression that “glycerin” is almost always derived from animals, which is why the relatively few products with veg-glycerin state its derivation in product labeling. I am just wondering, that’s all. Then I would recommend that you do not drink the pumpkin latte at Panera. I have made extensive research into the matter and have found that it can be sourced from either vegetables or animals. I have made contact with multiple people at Panera who have then contacted the supplier of the syrup and have been told it is vegetable sourced. If that is not enough to quell your fears then you might be best only eating food you grow at home. There’s lots of questionable food out there and the only way to be informed is to ask questions. I did that. I got the answers. Multiple times. Sadly most of the thick syrups from starbucks are not vegan (pumpkin, white mocha, caramel sauce, some of the other seasonal flavours like the dulche de leche). The mocha from behind the counter (not sure about the they sell) and anything in the clear tall bottles (vanilla, caramel, hazelnut, toffee nut, etc) are. 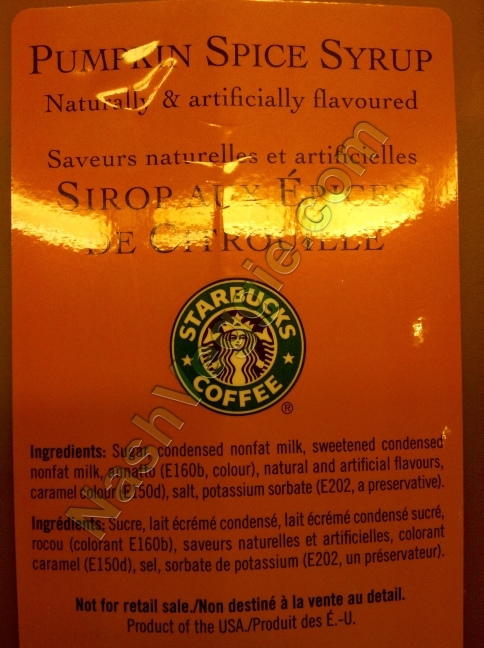 Also, the starbucks chai contains honey. good to know panera has a pumpkin spice latte with pumpkin in it… as a side note dunkin donuts pumpkin spice coffee, yes coffee, has milk in it, in the pumpkin spice syrup so it is indeed not vegan. boo… i need my pumpkin fix, wonder if whole foods makes vegan pumpkin spice lattes? Whole Foods does have pumpkin lattes and their syrup has no milk ingredients but it also has no pumpkin. It’s merely a spiced simple syrup. Have you tried my recipe? I tried looking for the recipe but it’s password protected.